Securitisation and Reconstruction of Financial Assets and Enforcement of Security Interest Act, 2002 - Sections 14 & 17(4A) - the observations as made in the order impugned after paragraph 11 had been rather unnecessary and the learned Single Judge, with respect, has been in error in issuing generalised directions and that too, to the extent that the borrowers have a right to be heard in the proceedings under Section 14 of the SARFAESI Act. HDB Financial Services v. Remo Software Pvt. Ltd.
1. These intra-court appeals are directed against the order dated 08.08.2017 in W.P.Nos.35597-35601/2017 and 35602- 35604/2017, whereby the learned Single Judge, while disposing of the said writ petitions filed by the tenants/lessees of the borrowers, has not only accepted the submissions of the parties that the tenants were to be provided an opportunity to approach the Debts Recovery Tribunal (‘DRT’) under Section 17(4A) of the Securitisation and Reconstruction of Financial Assets and Enforcement of Security Interest Act, 2002 (‘SARFAESI Act’), but has further proceeded to issue generalised directions, purportedly to the effect that even the borrowers have a right to be heard under Section 14 of the SARFAESI Act. 2. These intra-court appeals were initially considered by a Division Bench of this Court on 20.06.2018 and taking note of the submissions made on behalf of the appellant with reference to the decisions of the High Courts of Gujarat, Allahabad and Bombay, these appeals were admitted for consideration and the part of order impugned, to the extent it holds that the borrowers are entitled to be heard under Section 14 of the SARFAESI Act, was stayed. 3. In these appeals, service of notice to respondent Nos. 1, 3, 6, 11 and 12 was dispensed with; notices have been served in relation to the respondent Nos. 2, 5 and 7 to 10 who have remained unrepresented; and only the counsel for respondent No. 4/tenant has appeared before this Court. 4. Only the validity and correctness of the generalised directions in the impugned order dated 08.08.2017 being the subject-matter of these appeals, dilation on all the factual aspects is not necessary. Only a brief reference to the background aspects would suffice. 5. Put in brief, the relevant background aspects of the matter are that the landlords had secured a loan from the appellant-financial institution by mortgaging their property. 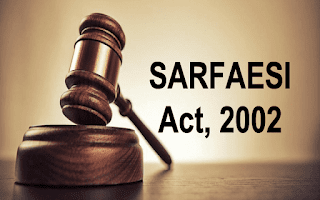 As the borrowers had defaulted in repayment of the loan amount, the appellant-financial institution proceeded under Section 13(2) of the SARFAESI Act by issuing notice dated 10.11.2016 towards recovery of the outstanding loan amount. The appellant-financial institution also preferred Crl. Misc. No. 2022/2017 under Section 14 of the SARFAESI Act before the Court of VIII ACMM, Bengaluru for taking over the possession of the secured asset, namely the building in question, wherein the tenants are said to be in occupation. The Magistrate, having considered the matter placed before it, passed the order dated 20.05.2017 (Annexure G) directing that no further notice was required to be given to any other person/s in lieu of the general notice that was pasted on the walls of the property; and further that the physical possession of the property be handed over to the financial institution. Thereafter, notices dated 31.07.2017 (Annexure E-1 to E4) came to be issued by the appellantfinancial institution to all the tenants, asking them to vacate the premises within a period of 7 days from the date of the receipt of the aforesaid notices, and on failure to do so, they will be evicted from the premises with the assistance of the Police Department. Being aggrieved by the aforementioned order passed by the Magistrate and notices issued thereafter, the tenants preferred the aforesaid writ petitions, being W.P. Nos.35597-35601/2017 and 35602-35604/2017. “9. The learned counsel for the Respondent – Financial Institution, therefore, has submitted that the petitioners/tenants should be directed to approach the Debt Recovery Tribunal in the matter. 10. He further submits that for a period of two weeks the Respondent – Financial Institution will not enforce the Security Interest by taking precipitative or other coercive measures to recover the physical possession, provided the petitioners/tenants not only approach the Debt Recovery Tribunal under Section 17(4-A) as extracted above, within the said period of two weeks from today, but also deposit the arrears of rentals as well as the current rentals payable by them to the Respondent landlords/borrowers with the Respondent Financial Institution – Bank. “19. Thus, as stated above, Section 14 does not exclude the principles of natural justice and therefore, Magistrate should hold an enquiry in the matter. The learned Magistrate cannot act simply on the basis of one sided Affidavit filed by the Bank/Financial Institution under Proviso to Section 14(1) of the Act. The borrowers have a right to controvert such Affidavit and the tenants in the premises also have a right to be heard in the matter. “20.Here, since the petitioners have an effective, alternative remedy under Section 17 (4A) of the SARFAESI Act, 2002 now available to them, where the Debt Recovery Tribunal can go into the question of validity of tenancy as per the said provisions, this Court would not make any observation on the merits of the contentions raised by the parties and the petitions are therefore disposed of with a liberty and direction to the petitioners to file their Applications before the concerned Debt Recovery Tribunal under Section 17(4-A) of the SARFAESI Act, 2002, within a period of two weeks from today and for a period of four weeks only from today, without any extension of time further by this Court, it is directed that the Respondent – Financial Institution, in execution of the impugned order under Section 14 of the SARFAESI Act, 2002, dated 20/05/2017 shall not take coercive measures for seeking physical and vacant possession of the said tenanted portions of the premises from the petitioners provided further that the petitioners will give an Undertaking in writing to the Respondent No.1, Financial Institution/ Bank that all arrears of rent and the current rentals due to be paid by them to the Respondent lessors/landlords will be made over to the respondent No.1 –Financial Institution within the aforesaid period of two weeks and they shall continue to deposit the rent with the Respondent No.1 – Financial Institution till they hold the possession of the said premises under their Lease/Rent Agreement. The operation of impugned order under Section 14 of the Act would abide by the orders to be passed by the DRT under Section 17(4A) of the Act. 21. The further course of action after four weeks from today, will be subject to the further orders to be passed by the Debt Recovery Tribunal as far as the petitioners tenants in the Secured Asset/premises in question are concerned. 22. It is made clear that the present order will govern only the case of the present lessees/tenants in the said premises, for the time being and will not affect any other action of the Respondent No.1 – Financial Institution against the principal borrowers/landlords/Respondents in the present writ petitions. 23. Accordingly the writ petitions stand disposed of. No costs. 9. Questioning the order aforesaid, the learned counsel for the appellant-financial institution has submitted in the first place that in fact, the appellant did not even get proper opportunity of contesting the writ petitions inasmuch as the notice was served at 12.30 p.m. on 08.08.2017 and on that very date, the matter was taken up at 2.30 p.m. and disposed of. Learned counsel would submit that even when the tenants of the mortgaged property were held entitled to an opportunity of hearing in view of the decisions of the Hon’ble Supreme Court in Harshad Govardhan Sondagar and Vishal N. Kalsaria (supra), there was absolutely no justification that generalised directions were issued even to the extent that the borrowers were also held having a right to be heard in the proceedings under Section 14 of the SARFAESI Act. Such directions, according to the counsel, do not stand in conformity with the law declared by the Supreme Court as also by this Court and various other High Courts. 10. Learned counsel for the respondent No.4 has essentially submitted that the tenants are entitled to an opportunity of hearing and have rightly been allowed such opportunity in the order impugned. 11. Having heard learned counsel for the parties and having perused the material placed on record, we are clearly of the view that the observations as made in the order impugned after paragraph 11 had been rather unnecessary and the learned Single Judge, with respect, has been in error in issuing generalised directions and that too, to the extent that the borrowers have a right to be heard in the proceedings under Section 14 of the SARFAESI Act [as occurring in paragraph 19 of the order impugned]. 12. In fact, it is apparent from the order impugned that it was submitted on behalf of the appellant–financial institution that the writ petitioners/tenants be directed to approach the Debts Recovery Tribunal in the matter and it was also submitted that for a period of two weeks, the financial institution will not enforce the security interest by taking precipitative action or coercive measures to recover the physical possession of the property. These submissions made on behalf of the appellantfinancial institution were agreed to on behalf of the petitioners, as recorded in paragraph 11 of the order impugned. 13. In our view, so far the writ petitions before the learned Single Judge were concerned, with such submissions of the parties, the matter ought to have been closed, of course, with necessary directions, as occurring in paragraph 20 to 22 of the order. 14. With respect, we are unable to endorse the other observations in the order impugned, particularly those occurring in the first part of the paragraph 19 [as reproduced hereinabove], wherein it is observed that the borrowers have a right to controvert the affidavit submitted in the proceedings under Section 14(1) of the SARFAESI Act. Such observations in paragraph 19 in the order impugned do not stand in conformity with the law declared by the Supreme Court in the case of Mardia Chemicals Ltd. and Ors. vs. Union of India and Ors. : (2004) 4 SCC 311 as also the decision of this Court in the case of Mrs.Sunanda Kumari and Anr. vs. Standard Chartered Bank : ILR 2007 KAR 16. The Supreme Court, in the cases of Harshad Govardhan and Vishal N. Kalsaria (supra), has not laid down the law that the borrower may also be extended an opportunity of hearing in the proceedings under Section 14 of the SARFAESI Act. “35. The decision of this Court rendered in the case of Harshad Govardhan Sondagar (supra) cannot be understood to have held that the provisions of the SARFAESI Act override the provisions of the Rent Control Act, and that the Banks are at liberty to evict the tenants residing in the tenanted premises which have been offered as collateral securities for loans on which default has been done by the debtor/landlord. 36. As far as granting leasehold rights being created after the property has been mortgaged to the bank, the consent of the creditor needs to be taken. We have already taken this view in the case of Harshad Govardhan Sondagar (supra). We have not stated anything to the effect that the tenancy created after mortgaging the property must necessarily be registered under the provisions of the Registration Act and the Stamp Act. “6. Regarding the question whether the Magistrate is required to issue notice to the borrower before passing an order under Section 14, we are of the view that, in the absence of any provision in the Act or the Rules framed thereunder requiring such notice, the Magistrate is not required to issue any notice to the borrower before passing an order under Section 14. Learned Counsel for the petitioners contended that even though there is no specific provision in the Act or the Rules requiring such notice, principles of natural justice require that a notice should be issued by the Magistrate before passing an order under Section 14. We are not inclined to agree with the above contention……”. 18. Hence, the questioned observations in the order impugned cannot be approved and deserve to be annulled. 19. Accordingly, and in view of the above, these appeals are allowed to the extent and in the manner that the part of the order impugned to the extent it holds that the borrowers are entitled to be heard under Section 14 of the SARFAESI Act is set aside and annulled.